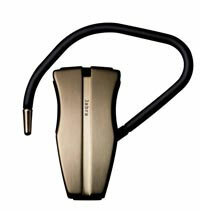 Okay, so here's another gold plated gadget for you, the Jabra JX10 cara. The Bluetooth headset comes in two models, the Jabra JX10 cara 24k gold and the stainless steel model. There are only a limited number of the Jabra JX10 Cara units available, 28,000 to be exact. The Jabra JX10 Cara has the same specifications as the ordinary Jabra JX10, Bluetooth 2.0, voice activated dialing and redialing, DSP technology, and a rated 6 hours talk time and 200 hours of standby time. The Jabra JX10 Cara weighs only 14 grams and has an operating range of 33 feet. The Jabra JX10 Cara costs around $300.